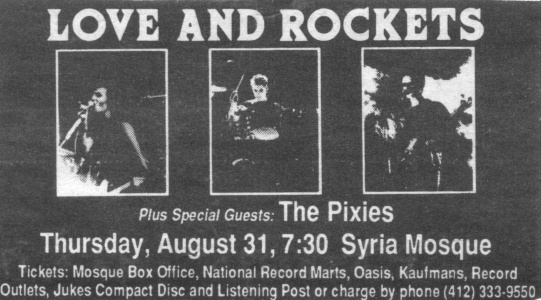 In the summer of 1989, Love and Rockets came back to Pittsburgh, on the second leg of their tour. I was terribly excited, and expected a big crowd, since the band had a single out that was rising high in the US charts. I was a rather mystified to be able to get a orchestra seat, late in the afternoon of the first day they went on sale. The show was wonderful. I knew all the songs, (unlike the previous L&R concert). I was dancing myself silly all night. If anything was wrong, it was that the band was almost too good, too smooth. As if they were performing on automatic pilot. What stands out most about this show to me, was what Danny was wearing. I couldn't get a really good look, (I was back a bit too far), but it seemed like he had on only a jacket - no pants. (Although, the newspaper review says that he was also wearing what looked like a mini-skirt. I couldn't see it.) I heard later, that the front rows got an interesting view, when Danny laid down on the stage during one of the songs. This choice of outfit is odd, considering that Danny said in interviews at the time, that he was leaving his dress-wearing for the encore. But, for the encore in Pittsburgh, he was wearing pants. Minor point, but it's what I remember most. Well, after the show, there was a group of people hanging around outside, in part because it was such a lovely late summer night. So, I decided to join them, and see what happened. Soon, two women came out, with backstage passes, and announced that they were selling a pass for $10. I wanted to buy one so much, but I didn't. I had a twenty dollar bill in my pocket, but still, I let them walk past me. I've never quite forgiven myself for this. My thinking at the time, was that maybe they were coming out, because the band was ready to leave. But that wasn't true, and I should have taken the chance, anyway. Copyright © 2002, 2009 Vivian Campbell. All rights reserved.